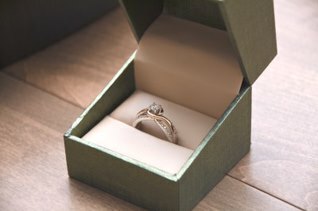 How Do You Actually Find the Right Engagement Ring? Congratulations on having decided to pop the big question! We know this is a huge moment in your life, and we know just how much you want everything about it to be flawless. But how do you actually find the right engagement ring? · Carats don’t measure the value. In case you are wondering, carats measure nothing more than the weight of a diamond – which does influence the price of the ring, but it isn’t the single most important characteristic (as it is in the case of gold, where carats are all about the purity of the gold itself). · Cut, clarity and color are also important. These together with Carats make up the “4C’s” of diamonds that you’ll often hear about. If you want to pick a ring that’s genuinely valuable, look into its cut (how many facets the diamond has), its clarity (how pure it is) and its color (some rare colors tend to be more valuable than others, such as black diamonds, for example). · Choose the precious metal for ring itself wisely. The reason you want to invest in a quality precious metal is because this is not a piece of jewelry that will be worn every now and again – it’s something your future wife will wear on her finger for the rest of her life. Therefore, you want to choose a precious metal that is strong, resiliant and pretty (such as palladium, platinum, yellow, white, or even rose gold, for that matter). Unsure of her style? A great option is to get engaged with the stone set in a simple gold solitaire setting. Then once you’re engaged you two can shop together for a setting or matching his and her setting that you both love. · Consider options for customizing the ring. There are cute, affordable ways to bring personality into a ring – such as a small inscription on its back. The date of the proposal, your wedding date, the anniversary of when you first started dating, or a short quote you know she loves – this kind of detail can make all the difference in the world! · Beyond the price tag, what is truly important is that the ring truly suits your future bride. In the end, she may not even be a fan of diamonds, so you can actually settle on a different precious stone. There are so many stunning options out there! Looking for the most talented wedding specialists in New Mexico? Contact New Mexico Wedding Expos & Guide and hire the amazing exhibitors here! They are all dedicated, experienced, and truly amazing at what they do – so they will definitely not disappoint you in any kind of way! Photo by Jackie Tsang on Unsplash.